The Jonart Professional Whelping Box has been the “Cadillac” of whelping boxes for over 16 years. We are so confident in the Quality and Durability of the JONART Whelping Box, we offer a 2 year guarantee. Built to last a lifetime. You will love the strength, durability and quality of this box. You won’t find a better made Whelping Box. Did you know that Jonart makes custom boxes? Give us a call and we’ll help you design a custom box to suit your needs. Check out the gallery for more images of our custom boxes. This is a HIGH QUALITY unbelievably durable box for the serious breeder. It won’t bend, shake, lift or breakdown and is held together with carriage bolts. The framework is so sturdy you can lean on it and even sit on the wall panels. 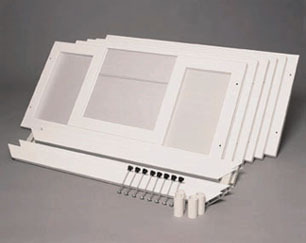 It is made of a Heavy Duty Plastic frame and FRP Plastic panels (like wall paneling, only plastic). This is not the corrugated stuff, it’s a safe, hard, strong and durable. Breeds of all sizes and strengths have used this box without fail. The insulated raised base floor panels keeps heat in and helps control the box temperature. You will love the strength, durability and quality of this box. You won’t find a better made Whelping Box. 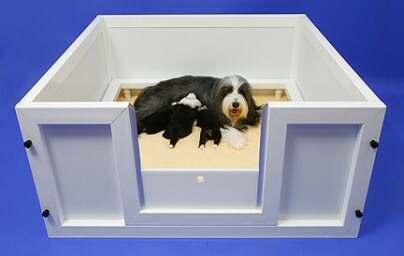 The Jonart Professional Whelping Box is made up of materials which are non-porous and easy to clean and store. Unlike the old “wood” whelping boxes, the JONART Professional Whelping Box won’t harbor bacteria. You can disinfect the Jonart Professional Whelping Box with confidence. When your whelping box arrives it will take only minutes to assemble. This easy assembly allows you to also break down and store the box in a compact manner using the shipping boxes it came in. 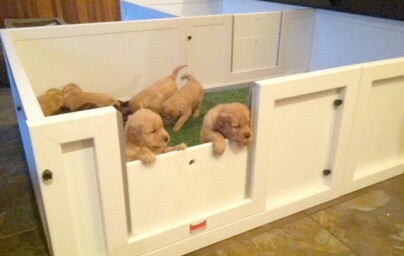 This is the last whelping box you’ll ever need to buy. It is sturdy, easy to clean, easy to assemble and easy to store. Jonart Professional Whelping Box….built to last!!!!!!! Don’t take our word for it, View Testimonials to see what our Customers have to say about the JONART Whelping Box. The ULTIMATE Veterinary Fleece Bedding is now available! Click here to view. Attachable Weaning Pens now Available!! A 48″ x 48″ whelping box pictured below prior to assembly.